My pumpkin cravings are strong this year – been considering an IV-drip, but instead opted to make pumpkin bars. This pumpkin bar recipe has been in my family for years - - via my Cousins Steve and Nikki’s mother Deb. I haven’t made these delicious bars in the last two years because of the cream cheese frosting and my husband’s aversion to things ‘white and creamy’. But sometimes I can’t resist recipes with cream cheese, and I have to be selfish sometimes and take care of my needs. I also figure my friends and neighbors and concierge downstairs could use a nice fall-time snack after a long week on a Friday afternoon. There is seriously no better pumpkin bar recipe. I remember my friend Carrie used to insist I bring these to our pot-luck Thanksgiving dinner over the holidays. 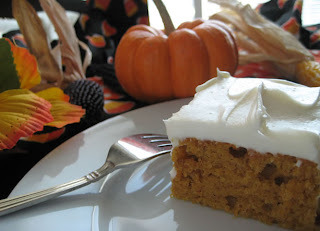 Pumpkin bars are a staple at my mother’s household – every year around fall my mother would make these. My mom included this recipe in the family cookbook with a note that says around Halloween she would buy pumpkin shaped candy corn to place on top of each bar or sprinkle each bar with Halloween-themed sprinkles to make them a little more festive. My mother, being the creative genius she is would also make a spider web on a few bars with black gel frosting and place a plastic spider on top. No matter how you choose to decorate your pumpkin bars, or if you make them for Halloween or Thanksgiving – I would highly recommend this recipe. They are light, fluffy and tasty – and ridiculously easy to make. Stir well then pour pumpkin batter into a jelly roll pan. Bake 25-30 minutes at 350 degrees (or until knife inserted comes out clean). I prefer using a jelly roll pan because it makes the pumpkin bars a little thinner then if you used a typical 9x13in pan. I think the frosting-to-cake ratio is better in a jelly roll pan. However, if all you have is a 9x13 inch pan, the recipe will still work great. The only difference is that you will have to bake the cake longer in the oven. And the best part . . . drum roll please . . . Mix together all ingredients for frosting. Frost the pumpkin cake once the cake is completely cool. I made these for the office and they were a hit! OMG!! I am a pumpkin hound. These pumpkin recipes sound yummy!! Got get to trying them. This looks ABSOLUTELY dee-lish! If you need a cocktail to accompany it, check out our Bumpkin (Bacon + Pumpkin) Pie-tini! Thanks for the Twitter follow! These Look And Sounded So Good! I Tried Them And They Taste As Good If Not Better Than They Look!